Palestinian political prisoner, Anas Ibrahim Shadeed, 22, has suspended hunger strike, which lasted for 22 days, after reaching an agreement with the Israeli Prison Authority to end his Administrative Detention and release him on December 19, 2018. 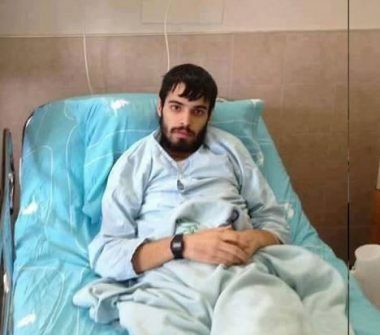 His brother, Abdul-Majid, said Anas, from Doura town southwest of Hebron in southern West Bank, was transferred, on Wednesday, to the Ramla prison, and added that he has lost a lot of weight, and is in a difficult health condition, including constant dizziness, headache and fatigue. The Detainees’ Media Center said Shadeed declared hunger strike on July 19th, protesting being held under arbitrary Administrative Detention orders without charges or trial, and added that he was abducted on June 14, 2017, after he was summoned for interrogation. After his abduction, the detainee received a six-month Administrative Detention order, which was renewed twice, each for six months. He was recently transferred to Hadarim prison, where he was placed in solitary confinement. During his previous imprisonment in 2016, Shadeed held a hunger strike for 88 days, protesting his Administrative Detention. An agreement was then reached to renew his detention one time for four months, ending in May 2017.